1. As of the end of March, the total value of equities in those 60 major stock markets reached $62.4 trillion and set several milestones. First, global equity values exceeded $62 trillion for the first time and established a new all-time monthly record in March (see chart above). Second, in each of the last five months except January, the global stock market capitalization has exceeded the previous cyclical record monthly high of $60.2 trillion set in October 2007 (see chart above). That was several months before the global economic slowdown and financial crisis started, and caused global equity values to plummet by more than 54% (and by almost $33 trillion), from $60.2 trillion at the end of 2007 to only $27.7 trillion by early 2009 (see chart). The record high $62.4 trillion world stock value in March was $2.2 trillion (and 3.7%) above the previous pre-recession peak. 2. Over the last year, world stock markets gained $7.3 trillion in value, rising from $55.15 trillion in March 2013 to $62.43 trillion last month. The 13% annual increase in world equity value over the last year was led by a strong 21% gain in the Europe-Africa-Middle East region, followed by a strong increase of 17.2% in the Americas, and a weak gain of only 1.4% in the Asia-Pacific region. 3. By individual country, the largest year-over-year increases in stock market values in March were recorded in Greece (117%), UAE (58%) Ireland (58%) and Oman (36.4%). In the U.S., the NASDAQ capitalization increased by 31.1% and the NYSE by 20.3%. The biggest losses in equity value over the last year (measured in U.S. dollars) were posted in Turkey (-30.6%), Peru (-26.7%) and Chile (-23.3%). The number of countries with positive increases in equity valuation over the last year (40) outnumbered countries with declines in stock market value (20) by two-to-one. 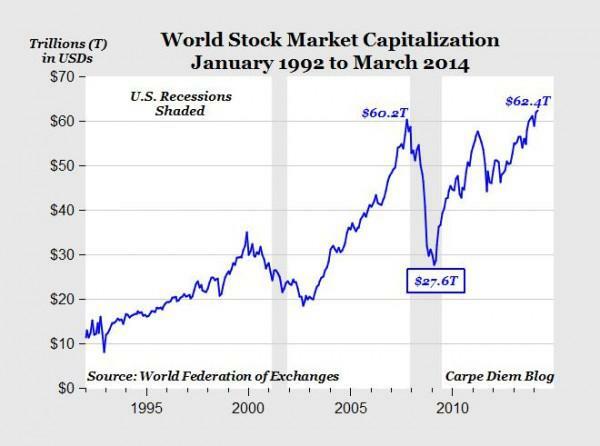 Compared to the recessionary low of $27.7 trillion in February 2009, the total world stock market capitalization has more than doubled (a 125% increase) in five years to the current record level of $62.4 trillion in March, more than recapturing all of the global equity value that was lost due to the severe global recession and the various financial, mortgage and housing crises in 2008 and 2009. The global stock market rally over the last five years to a fresh record high in March has added back almost $35 trillion to world equity values since 2009, and demonstrates the incredible resiliency of economies and financial markets to recover and prosper, even following the worst financial crisis and global economic slowdown in at least a generation.